Depending on the severity, ankle sprains may not seem like a big deal at first, but this is certainly not the case. Even a small sprain can cause increased tightness of the calf muscle, decreased coordination, and in some cases, even arthritis of the ankle joint. Plus ankle sprains really hurt! All of these nasty side effects can also increase the chance of re-injury. With the following information about sprained ankle diagnosis, treatment, and rehabilitation for your sprained ankle recovery, you will be more prepared to help yourself, or a loved one, if faced with this common injury. There are two main ligaments in the ankle, the Calcaneofibular ligament the Anterior talofibular ligament, these ligaments hold the ankle bones in position, and their job is to protect the ankle joint from twisting or turning, as well as from rolling of the foot. An Ankle sprain occurs when the ankle twists unnaturally, and damages these ligaments, causing pain and swelling of the ankle. Think of a ligament as a rubber band, able to stretch within their limits and then go back to their original shape, but like a rubber band, if it’s stretched further than it’s meant to, a sprain or strain will occur. A severe sprain can even cause actual tearing of the elastic fibers, much like when a rubber band breaks when stretched past its limit. This list shows how easy it is to sprain your ankle while doing regular, day-to-day activities. If any of these symptoms happen immediately or soon after twisting or rolling your ankle, chances are good that you have an ankle sprain. For accurate diagnosis and to make sure you do not have an ankle fracture, it is recommended that you see a doctor as soon as possible. 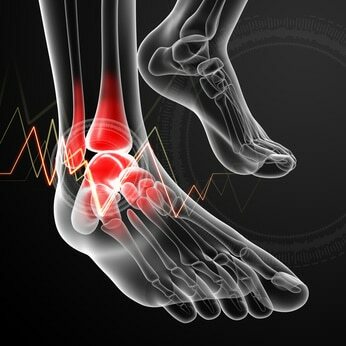 • Common Ankle Sprains: When ligaments on the outside of the ankle, or the Anterior Talofibular Ligament become injured, it is considered a common ankle sprain. These ligaments are important for stabilizing the ankle and rolling the ankle is often the cause of this type of ankle injury. There is typically a fairly short rehabilitation time for this type of injury. • High Ankle Sprains: High ankle sprains occur when a ligament above the ankle joint, a set called the “syndesmosis,” is injured. • Grade 1 sprain: Slight stretching and some damage to the fibers of the ligament. There is minimal tenderness and swelling and minimal inability to move the joint. Walking may be painful, but can be done. • Grade 2 sprain: Partial tearing of the ligament. If the ankle joint is examined and moved in certain ways, abnormal looseness and movement of the ankle joint is felt. There will be moderate swelling and tenderness of the joint, decreased range of motion and possible instability. Walking will be painful, but not impossible. • Grade 3 sprain: Complete tear of the ligament. If the ankle joint is pulled or pushed on in certain movements, severe looseness and movement of the joint is felt. There will be significant swelling and pain and significant instability of the joint. Walking on it will be impossible. • Topical Creams: Many of these analgesics active ingredients can be found in creams. If your ankle is not in a cast, direct placement of this cream on the injury can offer immediate pain relief. RICE stands for Rest, Ice, Compression, and Elevation. RICE is a time-honored way of healing a sprained ankle. Sometimes the best way to rest your leg is to be nonweightbearing, this means you have to stay off of the leg and not walk on it. Your doctor will tell you for how long depending on the type and severity of your sprained ankle, but it can range anywhere from several weeks to several months. Sometimes even just a few days of not walking on your ankle is all that’s needed to start feeling better. You will have several choices of mobility devices to use when you have a non-weight bearing injury. • Traditional crutches: While crutches are inexpensive and effective, they can cause pain in your hands, arms, wrists and underarms. When using sprained ankle crutches for walking or standing you will not have use of your hands and arms, making common everyday tasks impossible. Sprained ankle crutches will not allow you to keep your leg partially elevated, which is often prescribed by physicians as a therapy for lower leg injuries. • Knee scooters or “knee walkers”: Knee scooters are becoming increasingly popular due to the general dislike of crutches. 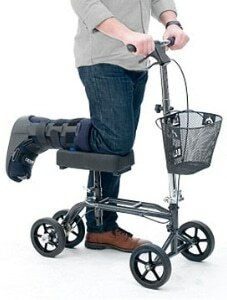 With knee scooters, you kneel on a shin platform and roll by propelling yourself with your good foot. They are efficient for distances but do not work well on uneven terrain, grades or tight places. They are heavy and bulky as well. They are quite restricting when performing your daily activities. You cannot use them on stairs. You will also need both hands to operate a knee scooter. • Hands Free Crutch: The iWALK2.0 is a pain free and hands free crutch alternative that combines the best of knee scooters and conventional sprained ankle crutches for sprained ankle recovery. Like a knee scooter, you kneel on a platform, so your weight is supported by your leg, not your hands and arms. Unlike the knee scooter though, the iWALK2.0 is lightweight, inexpensive and 100% hands free. It also allows you to walk normally, using the crutch as an extension of your leg, so you can continue with your daily routine. It’s fast and easy to learn and use, and allows you to navigate stairs and tight spaces like a kitchen or bathroom with ease, you can even use it while showering. 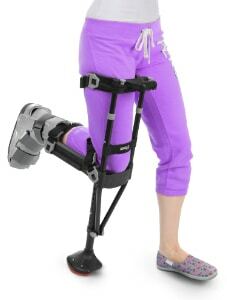 Many challenges with traditional sprained ankle crutches can be overcome. To learn more about the iWALK2.0, click here. Which mobility device is best for you? Find out here. Placing ice on the most painful area of the ankle while you rest is also helpful. It can be done throughout the day to help with swelling and pain relief. You can ice for up to 20 minutes, up to four times a day, but do not place the ice directly on your skin. Use a thin piece of cloth between the ice and your skin to protect your skin. If your skin becomes red or numb, remove the ice pack and in the future, ice for shorter amounts of time. A compression wrap can help to control swelling as well as immobilizing and supporting your sprained ankle. Applying a compression wrap, elastic bandage or ace bandage is fairly easy and can be done at home. Not sure how to wrap a sprained ankle? Here’s a video “How to Wrap an Ankle With an Ace Bandage”, demonstrating the right way. For additional support you can wear a protective brace or splint, which are both relatively inexpensive and can be found at most drugstores. Whenever possible, elevate your sprained ankle to help prevent, or limit swelling. Elevating the injured ankle above your heart will help keep fluid and blood from pooling in the ankle due to gravity. The best way to elevate your sprained ankle in bed is to place several pillows under your leg, one under your knee and one under the ankle. You can also elevate your ankle in a recliner, but remember to place several pillows under it so it is higher than your heart. Keep your ankle elevated for 48 hours and don’t walk on it. If your sprain improves with the R.I.C.E. treatment, seeing a doctor may not be necessary. However, if you have extreme pain, the swelling doesn’t go down with the R.I.C.E. treatment, or you have a lot of instability in the joint, seeing a doctor is recommended. Often, self-diagnosed ankle sprains can be hiding a broken bone. If you aren’t improving, your doctor may order X-rays to check for broken bones in the foot or ankle fractures. The injured ligament may feel tender when examined and the doctor may need to move your ankle in various ways to see which ligament has been hurt or torn. • Phase 1: Resting, protecting the ankle, and reducing the swelling with the R.I.C.E. protocol for one week. • Phase 2: Restoring range of motion, strength and flexibility for one to two weeks. • Phase 3: Slowly and gradually returning to activities that do not require turning or twisting the ankle and doing stretching exercises. Once the ankle is pain free you can start doing strengthening exercises followed by getting back into your activities like tennis, basketball or football. This phase can take weeks to months depending on the severity of your sprain. Once you have done about one week of stretching and range of motion exercises, the next phase is strengthening the ligaments again to prevent another sprained ankle when you start your regular activities. People who sprain their ankles have increased risk of incurring this injury again in the future, so make sure you fully rehabilitate your sprained ankle before starting activity again. The last phase of your recovery from an ankle sprain is working on your balance. Having good balance and proprioception will keep you from suffering future ankle sprains. People who have sprained their ankle are more prone to re-injury. There are ways to prevent ankle sprains from happening to you in the future. We can’t always predict or prevent an injury from happening, but we can take the following measures to ensure that we have a lower risk of ankle injury as we participate in physical activities. Lightly stretch your muscles, but don’t force a stretch by bouncing. Perform the movement until a nice stretch is felt and hold it there for 15 to 20 seconds. Jog in place for a few minutes to warm up your muscles before you start any physical activity. Conditioning your muscles for the activity you are participating in is important. The amount of time spent on the activity should be increased gradually to build up your muscle strength and mobility. Cross training can also help build these muscles. This is a very important part for any person to prevent foot injuries, even people who don’t participate in sports. People with low arches should choose shoes that provide support in both the front of the shoe and under the arch. The back of the shoe should be very stable. People with high arches should choose shoes with more cushion and a softer platform. When possible, use sport-specific shoes. Most people should replace their shoes every six months, more frequently if they are avid runners or heavy sports participants. When your heel feels broken down or the tread is thin that is the time to get new footwear. The information above is intended for informational purposes only and is not intended to prevent, treat, or diagnose any illness or disease. We aim to provide the highest quality information, so if you have any questions on the information above, we welcome your feedback! 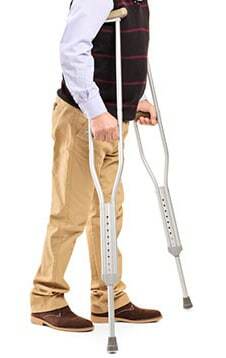 Do you hate sprained ankle crutches? Learn more or buy the revolutionary iWALK2.0 hands free crutch.